Twenty-seven species of Ranunuculus are recorded in Britain. 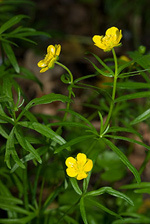 These include the native Meadow Buttercup (R. acris), Goldilocks Buttercup (R. auricomus), Bulbous Buttercup (R. bulbosus), Lesser Celandine (R. ficaria), Lesser Spearwort (R. flammula), Greater Spearwort (R. lingua) and Creeping Buttercup (R. repens). The BSBI provide a downloadable plant crib for water crowfoots and buttercups. Ranunculus ficaria is treated as Ficaria verna by Stace (2010). Adder's-toungue Spearwort (R. ophioglossifolius) is protected under Schedule 8 of the Wildlife and Countryside Act, 1981. River Water-crowfoot (R. fluitans) is protected in Northern Ireland under Schedule 8 of the Wildlife (Northern Ireland) Order, 1985. Twelve British miners are recorded on Ranunuculus. 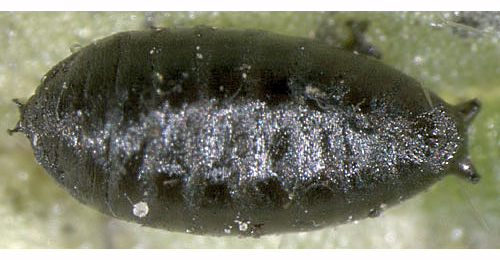 The agromyzid Phytomyza nigritula is recorded as a stem-borer on Ranunculus. The agromyids Phytomyza evanescens and Phytomyza nigritula feed as internal stem-borers of Ranunculus in Britain (Spencer, 1972). 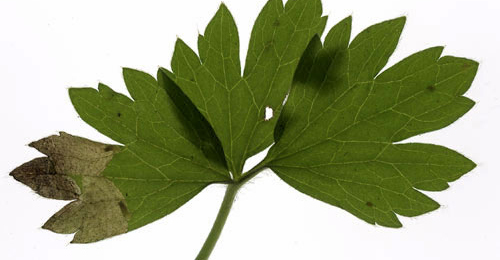 The agromyzid Phytomyza albipennis possibly feeds as an internal stem-borer of Ranunculus in Britain (Spencer, 1972). A key to the European miners recorded on Ranunculus is provided in Bladmineerders van Europa. 1a > Stem or petiole miner: Mine with offshoots into the leaf blade. 2 > Stem miner: An external stem mine. Frass is deposited at wide intervals. Pupation in the mine (Spencer, 1972b: 27; Spencer, 1976: 76). On Ranunculus acris in Britain and in addition other species of Ranunculus elsewhere. Uncommon in Britain, known only from Wilts and Dunbarton. Widespread in continental Europe. Ophiomyia ranunculicaulis Hering, 1949 [Diptera: Agromyzidae]. 3a > Leaf-miner: The larva mines in the petiole, from where it makes corridors fanning out in the blade. The corridors are parallel-sided, little branched and almost full-depth. In fresh mine primary feeding lines are visible. Pupation outside the mine (Bladmineerders van Europa). On Ranunculus repens in Britain and additional other species of Ranunculus elsewhere. Known only from London in Britain. Widespread in continental Europe. Phytomyza stolonigena Hering, 1949 [Diptera: Agromyzidae]. 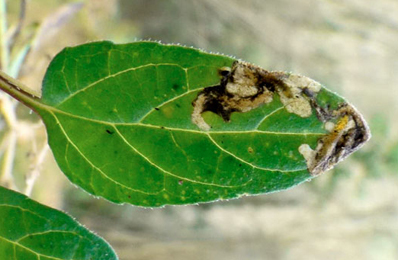 3b > Leaf-miner: Larva forms a primary blotch at the tip of a leaf segment (Spencer, 1976: 491). A brown primary blotch that may occupy an entire leaf segment. Frass dispersed. Primary and secondary feeding lines well visible. Pupation within the mine (Bladmineerders van Europa). On Ranunculus acris in Britain and elsewhere. Only in Banff and Inverness in Britain. Widespread in continental Europe. Phytomyza rydeni Hering, 1934 [Diptera: Agromyzidae]. 3c > Leaf-miner: Larva forms a linear mine, normally at the apex of leaf, winding backwards and forwards and thus forming a secondary blotch which quickly turns brown. Pupation internal (Spencer, 1976: 415). A compact secondary blotch, without islands of unmined green tissue. Mines usually dirty brown in colour, strikingly resembling a dead and rotting leaf segment. Both primary and secondary feeding lines apparent. Frass partly in long strings. Pupation takes place within the leaf, in a lower-surface puparial chamber, often somewhat removed from the mine itself (Bladmineerders van Europa). On Ranunculus acris, Ranunculus bulbosus and Ranunculus repens in Britain and additional other Ranunculus species elsewhere. Widespread in Britain in much of Europe. Phytomyza fallaciosa Brischke, 1880 [Diptera: Agromyzidae]. 3d > Leaf-miner: Long, upper-surface corridor with the frass in relatively large, widely dispersed fragments. Pupation outside the mine; exit slit in lower epidermis (Bladmineerders van Europa). Forms an elongated linear mine with the frass grains are widely spaced, which enables distinction between this species and P.ranunculi, where the frass is in closely adjoining grains. Pupation is external (British leafminers). On Ranunculus acris and Ranunculus repens in Britain and additional Ranunculus species elsewhere. Widespread in Britain and continental Europe. Phytomyza ranunculivora Hering, 1932 [Diptera: Agromyzidae]. 3e > Leaf-miner: Larva forms a conspicuous white linear mine with frass in closely adjoining grains. Pupation external (Spencer, 1972b:70 (figs 229-230A), 75; Spencer, 1976: 481, 483 (figs. 846, 848A)). Rather long, somewaht untidy, upper-surface corridor. Frass in many small grains that are close together of form pearl chains. Pupation outside the mine (Bladmineerders van Europa). The frass, in the long upper-surface white corridor, look like strings of pearls. P.ranunculivora makes similar long linear mines but in this species the frass grains are separate (British leafminers). On Ranunculus acris, Ranunculus bulbosus, Ficaria verna (= Ranunculus ficaria), Ranunculus flammula, Ranunculus lingua, Ranunculus repens and Ranunculus sardous in Britain and additional Ranunculus species elsewhere. Common and widespread throughout England and Scotland in Britain. Widespread throughout Europe, ange extending to the Kirghiz Republic of the [former] U.S.S.R. Also recorded in Canada, Chile and Japan. Phytomyza ranunculi (Schrank, 1803) [Diptera: Agromyzidae]. 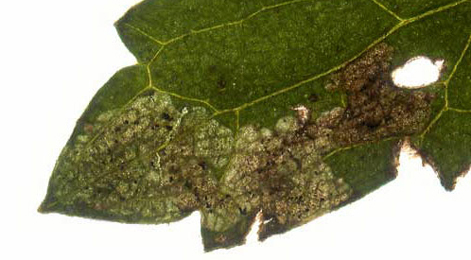 3f > Leaf mine: A secondary blotch near the apex of a leaf segment which develops from short, adjoining sections of a linear mine. Pupation takes place in the mine (Spencer, 1976: 482). A compact secondary blotch, without islets of unmined tissue. Mine without brown discoloration. Both primary and secondary feeding lines recognisable. Pupation within the leaf, in a lower-surface section of the mine (Bladmineerders van Europa). Phytomyza ranunculicola Hering, 1949 [Diptera: Agromyzidae]. 3g > Leaf-miner: Mine short, broad, essentially linear, sometimes with a small brown patch at beginning. Pupation external (Spencer, 1972b: 70 (fig. 228), 73); Spencer, 1976: 459 (fig. 806), 460). A short, broad corridor, with irregular sides. The mine often starts at a browned spot in the centre of the leaf. Pupation outside the mine (Bladmineerders van Europa). On Ranunculus acris and Ranunculus repens in Britain and additional Ranunculus species elsewhere. Probably widespread, at least in south, in Britain. Widespread in continental Europe. Phytomyza notata Meigen, 1830 [Diptera: Agromyzidae]. 3h > Leaf-miner: Full depth, initially a much branched corridor, irregular in width, in the end almost a blotch. The mine has openings by which part of the frass is ejected. 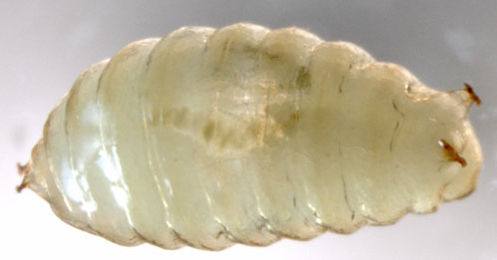 The larvae frequently leave the mine to restart elsewhere. Older larva live free and cause window feeding, often erasing their old mines. In Coltsfoot also pseudo-mines are made, when the larva eats away the lower epidermis with the leaf tissue, but spares the dense hair cover (Bladmineerders van Europa). On Ranunculus in Britain and numerous genera and species in several families elsewhere. Distribution in Britain unknown. Widespread in continental Europe. 3i > Leaf-miner: Small, full-depth mine, sometimes strongly branched and corridor-like, more blotchy at other occasions. As a rule a number of mines in a leaf. A larva makes several mines. Pupation external. On Ranunculus in Britain and elsewhere. Polyphagous. On numerous genera and species of several plant families, including Ranunculus, in Britain. On numerous genera and species of several plant families, including Ranunculus, elsewhere. Widespread in Britain and continental Europe. Also recorded from the Channel Is. 1b > Leaf-miner: Rather narrow corridor, untidy and sometimes branched, starting from the base of the leaf, in particular the midrib. Sides of the corridor irregularly eaten out, not really parallel. Frass mostly present, and then in a central line. The larva is capable of leaving the mine and start a new one elsewhere. These later mines are much broader, and the frass is scattered irregularly. (Bladmineerders van Europa). Host plants unknown in Britain. On numerous genera and species in several plant families, including Ranunculus, elsewhere. Recorded in southern England. Widespread in continental Europe. 1c > Leaf-miner: Large glassy blotch, beginning as a short full depth corridor along the leaf margin Mine in the tip of a leaf segment. The leaf tissue around the mine often turning dark purple. Much, coarse, frass. Pupation outside the mine (Bladmineerders van Europa). On Ranunculus in Britain and elsewhere. Britain. including Surrey. Also recorded in the Republic of Ireland. Widespread in continental Europe. Pseudodineura fuscula (Klug, 1816) [Hymenoptera: Tenthredinidae].